Riva del Garda, Italy (July 22, 2018) - Despite the fact that Riva del Garda for the Melges 20s got off to a slow start (no wind, rain on Friday), the fleet was full speed on Saturday and Sunday making the most of an amazing racing venue. With its conclusion, the International fleet now travels to the beautiful island of Sardinia and its capital city, Cagliari for the fifth event of the circuit on September 14-16, the same location set to host the Worlds happening on October 10-13, 2018. For Rytov, his success in Riva del Garda was spectacular, and is just another feather he happily adds to an already crowded championship cap. With this victory, and as the reigning European and Melges World League Champion, Rytov will clearly be the favored team heading into Cagliari. 'RUSSIAN BOGATYRS is back at a crucial time on the circuit, therefore we are happy with the result and more generally, our performance," said Rytov post racing. "We are ready to maximize the possibilities in what we expect to be a great season. In Cagliari, for sure the challenge is open and we will try to place as high as we can in both events, especially the Worlds, in an effort to defend our Melges World League title." Even though it was not a shining day of results for Rytov, he and his team of tactician Kostantin Besputin and crewman Anton Sergeev stayed strong regardless of submitting two double-digit scores on a critical three-race day. The individual race winners were varied, and to some degree not so surprising. Race Four was won by Poland's Krzysztof Krempec aboard MAG TINY. The final races of the event went to Alexander Ezhkov's PIROGOVO (Race Five), and Vladimir Prosikhin's NIKA (Race Six). This abrupt shake up in results changed the names drastically on Sunday for the remaining top five positions, leaving a fierce duel between nations - the U.S.A. and Russia. Alexander Novoselov's VICTOR is second-runner up after a banner day on the water. His two, top-three finishes successfully moved him up the charts giving him his best Melges 20 Class finish yet. American's Jim Wilson on OLEANDER, and World Champ Drew Freides' PACIFIC YANKEE climbed the scoreboard to finish third and fourth respectively. The fleet welcomes a new face and name to the top five, Pavel Grachev at the helm of MEDYZA. A successful challenge from Alexander Mikhaylik's ALEX TEAM placed him atop the Corinthian podium. Marco Giannini's SIDERVAL came second, while another new name, Alexei Bunzya's 205 took home third place honors. 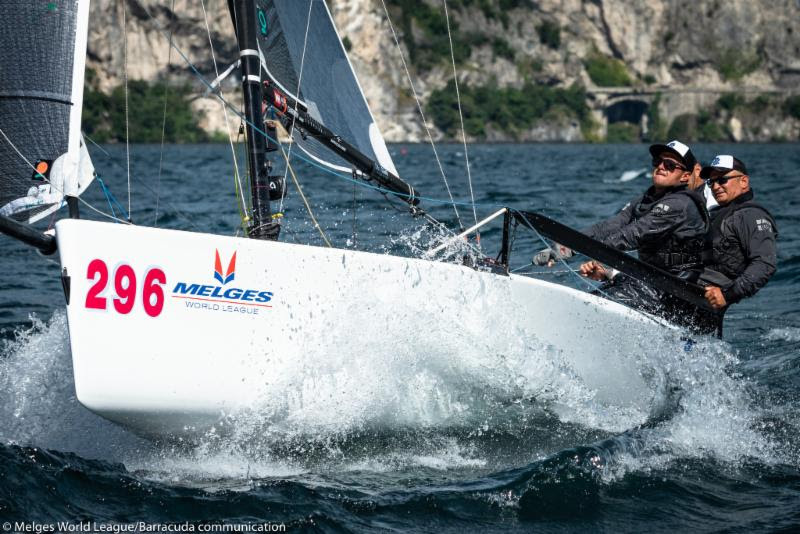 In counting the points of the Melges 20 World League, European Division ranking, the competition will further intensify as the season progresses. Two events remain - Event No. 5 in mid-September, and the highly anticipated World Championship just one month later. Currently, Prosikhin is the leader, however Ezhkov and Filippo Pacinotti's BRONTOLO are lurking right behind equal in points.